Five 1952 Topps Mickey Mantle cards found in boyhood collection. WEST HARTFORD, CONNECTICUT - CBS News reports that two brothers found 5 baseball cards that could collectively garner over $1 million in their childhood card collection stored in the family attic. CBS story of brothers finding the cards (3-minutes). Eric Chesterson wrote for MLB.com that the brothers, John and Ed, collected cards as children. They grew up in Connecticut, but were stalwart Yankees fans. They managed to get a hold of five 1952 Topps Mickey Mantle cards. When they stopped collecting, the box of cards was stored in their mother’s attic. Following their mom’s passing in 2006, they moved the box to John’s basement. 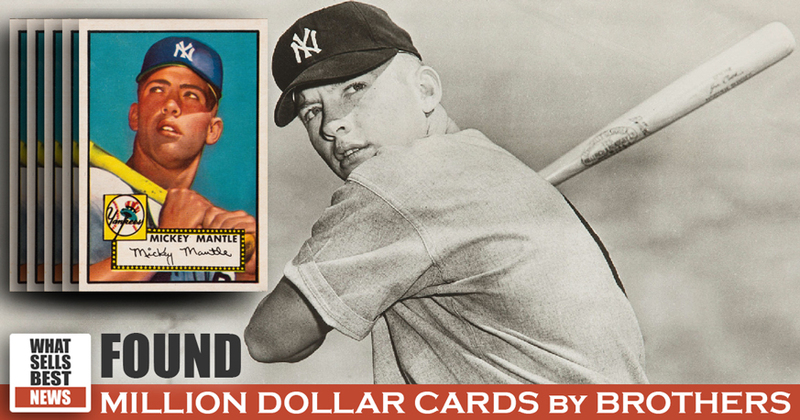 John and Ed decided to look through their cards when they found out that a ‘52 Mantle card sold for nearly $3 million. In an interview with the Associated Press regarding the price of that Mantle card, John said “This is going to be interesting. [In] tomorrow's New York Times, they're going to print they had a typo and they had an extra zero in it.” Once they took a look at what they had, they called Heritage Auctioneers to evaluate their cards. Heritage Auctions is one of the largest auctioneers of collectibles in the world. CBS Report on Mickey Mantle card sold for $2.8 million (1-minute). In an article published by USA Today, the brothers say their father gave them a great example of collection caretaking. John and Ed’s father collected coins, stamps, and postcards, which showed the brothers how to take care of their own collection of baseball cards. Chris Ivy, Director of Sports Auctions at Heritage Auctions, sees this all of the time. He explained “People go into the attic and they start searching. Who knows how many people have thrown millions of dollars away just because they don't know what they've got?” This is also a primary source of yard sale finds. Mickey Mantle story by Biography (3-minutes). The 1952 Topps Mickey Mantle card is one of the rarest, and therefore most sought after, baseball cards. This is largely due to the fact that Topps had difficulty selling them initially. After selling them for pennies at carnivals, Sy Berger dumped the remaining cards in the Atlantic Ocean after they sat in storage for seven years. Topps needed the warehouse space. Two other Mantle cards in their collection are rated at PSA 7 and 5, and were estimated to sell at $100,000 and $40,000 respectively. The brothers had already sold some of their collection, with profits totaling about $250,000 before the auction. The auction included 6 cards from their collection, three 1952 Mickey Mantle cards and three others. The PSA 8.5 Mickey Mantle sold for $810,000, and the current owner is actively entertaining offers according to HA.com, Heritage Auctions website.